Raumfahrt+Astronomie-Blog von CENAP - Blog: Astronomie - Beweist Neutronenstern die Vakuumdoppelbrechung ? The effect — known as "vacuum birefringence" — was predicted 80 years ago, but astronomers had to look at the light of a faint neutron star to prove it. According to quantum physics, the vacuum of space isn't really empty — virtual particles pop in and out of existence even in the emptiest of empty voids. These "virtual" particles may sound like ghostly apparitions, but now astronomers think they've spotted the interference caused by virtual particles in the dim light generated by a dense stellar nugget of degenerate matter. This nugget is a nearby neutron star called RX J1856.5-3754, located some 400 light-years away, and researchers using the ESO's Very Large Telescope (VLT) high in the Atacama Desert in Chile have, for the first time, detected a quantum effect that was first predicted in the 1930s. This effect is known as "vacuum birefringence" and possible observational evidence of it in action could have a profound impact on our understanding of how the universe works. It may sound strange that we can measure quantum effects near the surface of a neutron star hundreds of light-years away, but often we have to look at some of the most extreme natural "laboratories" deep in the cosmos to stand a chance of glimpsing minuscule physics that has a huge effect on astronomical data. And in the case of RX J1856.5-3754, its powerful magnetic field is thought to have manipulated virtual particles fizzing in and out of the vacuum to create a prism-like effect on the faint light generated by the neutron star. Virtual particles underpin many curious theories in astrophysics, particularly the mechanism behind Hawking radiation — a neat theory put forward by physicist Stephen Hawking in the 1970s that suggests black holes may evaporate. Whether black holes evaporate or that virtual particles have a role to play is a matter of heated debate, but the way these ghostly quantum apparitions interact with magnetic fields can have observational effects. In classical physics, if light travels through a vacuum, it will remain unchanged. However, if QED hold true and virtual particles are present in the vacuum immediately surrounding a neutron star, the magnetic field will interact with virtual particles to manipulate light as it travels through. This effect is predicted by "quantum electrodynamics," otherwise known as "QED." In this case, the VLT has detected a strange polarization of light coming from the neutron star, suggesting vacuum birefringence is at play. "According to QED, a highly magnetized vacuum behaves as a prism for the propagation of light, an effect known as vacuum birefringence," said lead researcher Roberto Mignani, of INAF Milan in Italy and the University of Zielona Gora in Poland. Mignani's tem's research will be published in the journal Monthly Notices of the Royal Astronomical Society. "This effect can be detected only in the presence of enormously strong magnetic fields, such as those around neutron stars," added Roberto Turolla of the University of Padua, Italy. "This shows, once more, that neutron stars are invaluable laboratories in which to study the fundamental laws of nature." Neutron stars are the remnants of stars around ten-times the mass of our sun. When these stars run out of hydrogen fuel, they explode as spectacular supernovas. What's left behind is a tiny and extremely dense sphere of mainly neutrons. Interestingly, these neutron stars retain the angular momentum and magnetism of their parent stars, only on a much more extreme scale. Pulsars are rapidly spinning neutron stars and these are known as the most precise "clocks" in the universe, flashing at a very steady rate. These factors make neutron stars ideal locations for astronomers to measure the effects of general relativity and strong magnetism. And now, astronomers are using neutron stars to uncover evidence of a quantum effect that was theorized over 80 years ago, but it's only the beginning. 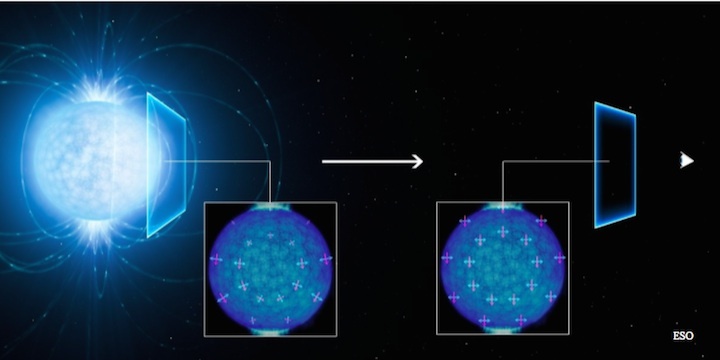 "Polarisation measurements with the next generation of telescopes, such as ESO's European Extremely Large Telescope, could play a crucial role in testing QED predictions of vacuum birefringence effects around many more neutron stars," said Mignani. Image: This artist's view shows how the light coming from the surface of a strongly magnetic neutron star (left) becomes linearly polarised as it travels through the vacuum of space close to the star on its way to the observer on Earth (right).